Tripp is one of Gigantic's most divisive characters as she fulfills the stereotypical assassin role of attacking from invisibility, for huge damage. As is typical with such a design, she can not only deal eye watering damage upon appearing but she also has incredible mobility. Her sole purpose is to kill weak targets, back cap and generally disrupt the backline. She's undoubtedly high risk and high reward because with skilled play, she can not only get in and out of combat quickly, but also leave a trail of bodies behind her. The one catch with Tripp is that she's incredibly squishy if she's caught out of position or if she isn't able to turn invisible, at which point you'll need to duke the opposition in order to survive. This section of our guide contains a list of Tripp skills, what they do, which upgrades you should choose (and when) as well as what those upgrades are for. Lightning Strikes is your basic attack and it allows Tripp to deal incredibly quick melee attacks to her opponent. 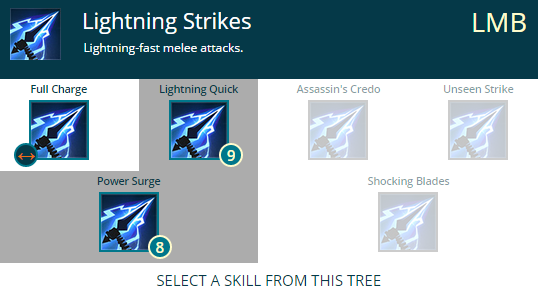 With talents you can gain a significant speed boost from using Lightning Strikes as well as an incremental damage increase. 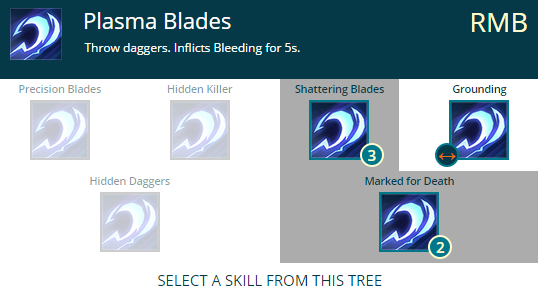 Plasma Blades ir your only ranged attack and it causes Bleeding on players it hits, for 5 seconds. Although the tooltip doesn't state it, you throw just two daggers which cause minor direct damage and non-stacking Bleeding. If you don't hit both daggers it isn't a major damage loss as one stack of Bleeding (because they don't stack) is more than sufficient. What makes this skill so amazing is the fact that when talented, it breaks an enemies armor. Electric Slide is a valuable skill for engaging an enemy or escaping. Pressing Q once allows you to activate the slide but pressing it again will cause you to kick the legs from under a player, knocking them down. 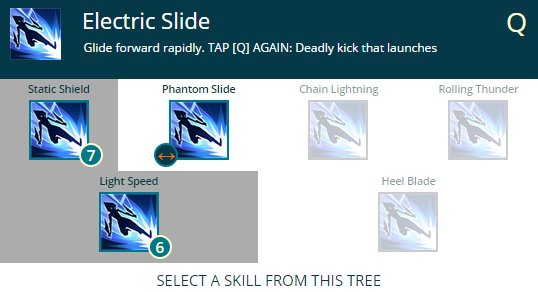 Similarly to Plasman Blades, the tooltip doesn't inform you that you actually get a slight movement buff from using Electric Slide and it also has a slightly longer cooldown if you choose to utilise the kick. Key to Tripp's playstyle, Flashdance allows her to turn invisible for 6 seconds. Even though Flashdance provides an incredible useful means of escaping (and engaging on enemies) you can still be seen as an enemy aiming at you or in your direction will see their crosshair turn red, and eagle eyed players will also be able to see your shimmer (though I admit, it's very difficult). Bladestorm causes Tripp to deal huge damage to a target and during it, she'll interrupt them. As with any Focus skill, there's 3 Tiers to it (should you save up such an amount of Focus). By the 3rd Tier Bladestorm can strike multiple enemies, allowing you to deal damage to an entire team. Combined with the interrupt and your immunity to damage during the attack, it's not uncommon to see Bladestorm turn the tide of a fight. Below is the upgrade path I would recommend for each skill. It offers Tripp high damage, a valuable armor break but importantly a significant amount of mobility. Thanks to such mobility, this build allows Tripp to survive for long periods even without Flashdance. Power Surge allows Tripp to gain additional damage output every time she strikes a target with her LMB. Each strike provides +8% damage, maxing out at +40% damage. Against most players you'll rarely reach that number, but 15-25% isn't out of the question. Against Creatures however, it's super easy (and fast) to reach the 40% damage bonus. 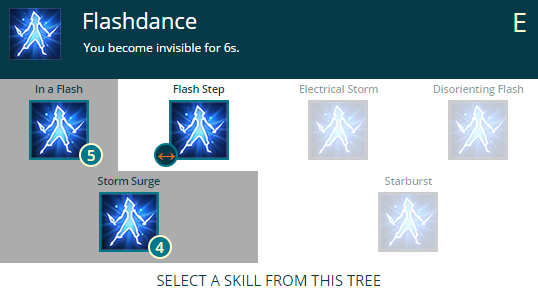 Following on from Power Surge, Lightning Quick increases your movement speed by 25% when you use Lightning Strikes. It's amazing for allowing you to escape quickly and to strafe around players as you fight them. Marked for Death allows your RMB to deal additional damage if you use the LMB at the same time. Although it isn't an amazing upgrade, it's Shattering Blades that we're after. When you use your RMB on a player, you'll break their armor (as well as still cause Bleeding) allowing you to deal huge damage to an opponent. Light Speed allows you to move much further with Electric Slide and when sliding, move even faster. For escaping, it's absolutely invaluable and a must-have upgrade. Combined with Static Shield that allows you to deflect projectiles back at opponents who fire at you from the front, it's incredibly easy to quickly reach ranged Hero's such as Charnok or Voden. Storm Surge provides Tripp with +25% movement speed when invisible. The value of this is the fact that it allows you to travel so much further and to really make use of the 6 seconds of invisibility that Flashdance provides. In a Flash allows Flashdance to become instant and it will also remove Launch and Stun from you - two of the crowd control effects that can easily see you be killed. In the Zone increases your Critical Hit chance by 100%. It pretty much gaurentees that you melt someone 1 on 1 and if you do happen to have 3 Focus, it's a good burst against an enemy team. Tripp's main purpose is to deal huge damage to players as quickly as possible and it's your role to try to "gank" those at low health. Thanks to Killer Instinct, having 15% higher damage when an opponent is at 50% health or below is a significant boost to your damage output. Variable: Back in a Flash is a good alternative as it allows you to use Flash Dance much more often, allowing you to remain invisible for longer. If you find you aren't being too heavily focused, take Killer Instinct. If you are, take Back in a Flash. Ambush provides Tripp 20% extra Crit Chance but also 10% Crit Damage from behind. It's really great for allowing you to burst players even quicker and as you should regularly be trying to hit players from behind, it's easy to gain regular use from this talent. Variable: Acrobatics is a great alternative for significantly reducing the stamina cost to jumping and dodging. It's really important as Tripp to use both of these but it's also stamina intensive without this talent. The best of the two, En Garde provides you with 10 additional armor by default but an extra +20 when attacking. If nothing else it allows you to withstand a little more punishement whilst fighting an opponent. Hero's Might provides Tripp with +10% extra damage. Although it won't boost your damage by a huge amount, it's an increment that'll help burst players down quicker. This section of our guide contains a list of tactics for skirmishing, team fighting and dueling against Hero's with Tripp. I've found Aisling particularly challenging for Tripp because she uses Cador to body block, she can self heal and immobilize you. If you can get a good opening burst on her before she realises, you're in a much better position and if possible, try to break her armor as soon as you can. Once she's on the defensive and if she does recall Cador, you're in a much better position to deal with her. Try to save your knockdown from Electric Slide for when she doesn't have Cador. Charnok is only a challenge if he stays at range. Although he'll never kill you just by using his LMB (you can always Flashdance away) it's when he's in your face that there's a problem. His burning combined with his knockback on Dragon's Breah make it difficult to pin him down, especially if he uses Detonate. Having said that, you can also burst him down so fast that none of it really matters. Just be sure to avoid his Hot Hail (especially if he has upgraded it to slow). Griselma is super easy for Tripp to kill as long as she doesn't have her hands. If she does, just avoid her at all costs because once you do attack her, she'll use Displacement and let her hands do the work. If she's without her hands, she's a free kill but again, only if she doesn't have displacement. A good Griselma will portal away every time you get near her. HK-206 is fairly easy for Tripp to deal with thanks to your speed and ability to break his armor. If you can get up close and personal, he'll die pretty quick as long as you keep straffing around him. If you can, be sure to avoid his Mortar. Imani is never going to kill you from afar unless you're doing something seriously wrong (at the very least it'll take two hits from her rifle). When you do find her - which is super easy considering the amount of back-capping - she's pretty much doomed. Just try your best to wait until she comes out of stealth and you'll easily be able to kill her just by using LMB. Lord Knossos versus Tripp is incredibly difficult because even if you burst him from the opener, he'll usually just turn around, Gore you, and proceed to beat you on until you're dead. You can certainly try to knock him down or break his armor, but going toe to toe with Lord Knossos usually ends badly. If he's already low health however, it's fair game. Mozu is really easy for Tripp to kill because she's so squishy. After your opening burst it's pretty much gaurenteed she will Dimension Door away. When she does, just follow her with Electric Slide and knock her down. Once she's knocked down, she'll try to interrupt you with Attractor Beam but it's still inevitable that she'll die. The only way she'll evade you is if she teleports onto a raised platform. The Margrave is tough to fight against for Tripp simply because he can withstand so much punishment but also regularly interrupt you. If he's low health he's fairly easy to deal with from burst but it's when he's full that you need to worry. In all honesty if he is full health, I'd recommend you avoid him. Tripp versus Tripp is one based purely on who opens on the other first and who doesn't happen to mess up. The best advice I can give is to try to attack first, don't miss your kick from Electric Slide and most importantly - always keep attacking with your left mouse button. Tyto the Swift is only really difficult as Tripp if you find that your Flashdance is on cooldown. It leaves you vulnerable to him training you at which point you'll take a load of damage. If however you can open on Tyto he'll not only take a huge amount of damage but be instantly on the back foot. Try to knock him down early, break his armor with Plasma Blades and duke him whilst using LMB. If you've your Focus, you can use it for a super quick take down. Uncle Sven is a slippery for Tripp because of his super jump, self heal and armor break. Combined with his burning fields he can be a handful. Having said that, he's also super squishy and if you can force him to use his heal early, he's much easier to deal with. Just remember that he'll always try to escape up a high ledge so try to follow him if you can. Vadasi is super easy for Tripp to kill unless she has her Focus. If she does and she has taken Uplifting Chorus and Gust, you'll struggle to pin her down. If she doesn't have her Focus, it's impossible for her to deal enough damage to you quick enough to kill you, before you kill her. Just hit her hard, break her armor and knock her down. Try to avoid her Smite but even if you do take a few hits to the face, it isn't enough to stop you. A good Voden is a challenge for Tripp because of his slow, poison (which lets him track you - sort of) and self heal. His Green Man decoy also allows him to quickly escape and if he has lots of stamina, you'll never catch him. If he's pursued a heavy poison build, you'll take a fair chunk of damage whilst you try to deal with him. In spite of him being annoying, your speed gives you a fairly easy time of avoiding his arrows meaning the vast majority of his damage is passive from being caught in his Poison Spores. If you can, try to bait his Hidden Spring and once he's jumped from it, follow it up with Plasma Blades/Kick/LMB. Wu, as always, is a nuisance but he's also incredibly squishy at the time time.If he does Tongue Lash you when you're out of stealth you can always sprint away and/or use Flashdance. If you're going toe to toe with him, you're also much faster and your Focus stronger. Just try to break his armor early and dodge his most obvious attacks (Splash Kicks and Crashing Waves). Xenobia is always annoying and she poses somewhat of a challenge for Tripp. Her ability to immobilize, weaken and cause burning can hurt you significantly. If she has her Focus, you can also be in serious trouble if she lands her full chain of skills. If you dodge her immobilize however, you're in a much better position to then avoid all her attacks and quickly kill her. Remember that Xenobia has no gaurenteed "out" so if she's low on stamina, she's easily killed. This section of our guide contains a list of tips and tricks we think will help your Tripp play. We'll continue to add to the list as required and if you have any tips you'd like to share, let us know in the comments below and we'll place them here. 1. Flashdance is key to Tripp being so powerful. Don't waste your invisibility and instead learn when to be out in the open and when to disappear. 2. Always try to focus targets that are low health or which are, by default, "squishy". They're easier to kill and allow you to get fat early game by picking them off. 3. Back capping is an important role that Tripp plays because it allows her to remove enemy Cerberus and map prescence but also allows her to gain additional experience from Creature kills. Doing this further helps you get ahead during early game. 4. Try to avoid engaging against enemy Hero's that are particularly "tanky" or ones which can cause you problems due to their damage or interrupts. The Margrave, Lord Knossos and Aisling are particularly tough. 5. Remember that eagle-eyed players can track you in stealth and if you have poison or burning on you, they'll know. Try to make sporadic movements when using Flashdance to escape. 6. Electric slide, despite being great for engaging on enemies is also incredible at allowing you to escape quickly. Make use of it if being chased. 7. Always try to be on the edge of a fight with a clear exit route. Once you've burst an opponent, you really shouldn't stick around as you can be quickly focused (especially if Flashdance isn't ready).